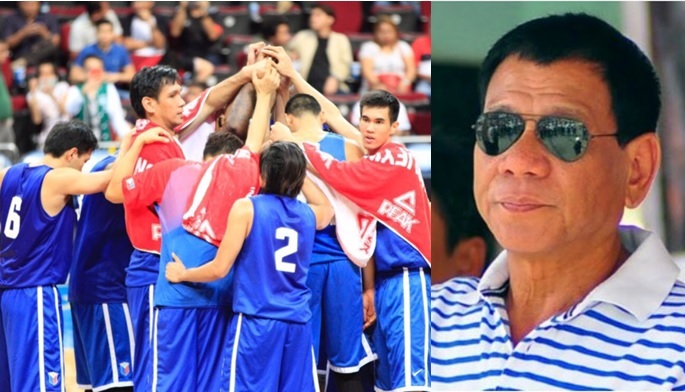 MANILA, Philippines - T-minus 48 hours before the 2016 FIBA Olympic Qualifiers Manila kicks in, Presidential Executive Assistant Bong Go reveals that President Rodrigo Duterte may come to watch Gilas Pilipinas’ first game against France on Tuesday, July 5 at Mall Of Asia Arena in Pasay City. President Duterte to take a break in drug busting to watch Gilas Pilipinas vs France on Tuesday. Duterte although admitted that he’s not into basketball, still intends to boost the national cagers’ morale and show his support for Filipino athletes. “Though hindi siya masyado mahilig sa basketball, alam mo naman si Presidente, pag para sa bayan, full support yan,” uttered by Go. Many Filipinos admire Duterte for being so emphatic and 'makabayan.' Just last month, Duterte met PBA Legend Ramon “El Presidente” Fernandez and offered him the Philippine Sports Commission (PSC) Chairman position, but the former national player declined the offer and agreed to be one of the department’s commissioners instead. President Duterte is expected to address the national athletes’ long-time clamor on lack of government support when it comes to funding. It’s really evident that Philippines has lots of potential when it comes to sports. But Filipino talents are just getting into waste due to lack of financial assistance from the government. If not for the financial aid from business tycoon and Philippine basketball godfather Manny Pangilinan, Gilas Pilipinas wouldn’t probably in the international scene. Private business firms are mostly the main source for Pinoy athletes’ funds like Manny Pacquiao who was backed-up by Nike, Ricoa and Motolite just to name a few. As of publishing, neither of the Gilas coaching staff has given any statement on Duterte’s plan on watching their first game live. But for sure, the players and the coaches will be motivated more and offer the game to the new President and the rest of the Filipino people. With President Rody Duterte in control, sports enthusiasts are now hopeful to see more Filipinos excelling in international sporting scenes.